Green manure is a crop or plant that is grown and then intentionally plowed under to improve the underlying soil. The term is sometimes confused with "raw manure," but the two are not the same. Raw manure is animal waste. Adding organic matter to the soil releases important plant nutrients, such as nitrogen, potassium, and phosphorous, in addition to trace minerals that come from the decomposing organic matter after you dig the crop into the soil. All of these nutrients help to increase crop yields. No matter what kind of soil you're starting with, green manure can have a positive impact by dramatically improving poor soils as well as maintaining already healthy soil. Green manure also can help prevent soil erosion in areas with sandy soil, and help keep weeds from growing. Many varieties can even draw bees and butterflies to your garden, which help with pollination and keeping away pest insects such as aphids. Green manure is sometimes alternatively called a "cover crop," but there is a key difference. Cover crops refer to plants grown over the soil to protect it, while green manure is specifically grown to be tilled back into the soil. Not just an inexpensive way to improve land, green manure is an eco-friendly farming practice that helps decrease emissions that would add up if you had to transport fertilizers to the farm. Instead, by planting seeds for your preferred sources of green manure, you can limit the amount of energy you must use to haul and distribute fertilizers on your land. Common crops used for green manure include soybeans, clover, and rye, but a wide variety of plants can be used. Each type of crop provides certain benefits. Most plants improve the nitrogen levels in your soil once they are tilled in. A green manure crop of alfalfa can send roots down as far as 60 feet, which pulls nutrients from the depths up to the surface to benefit your next season’s crop. Winter tare and hairy vetch have extensive root systems that prevent erosion and long leafy vines that grow in the winter, protecting the surface of your soil—serving as a built-in mulch that won’t blow away during winter storms. Woody pod vetch is super hardy and robust and helps eliminate weeds by crowding them out. Some crops, such as lupin, have relatively quick life cycles, so you can perform green manure treatments in as short as eight-week cycles. Agricultural mustard matures in as little as six weeks. If you can grow them in your area, legumes like peas and fava beans are especially good for adding nitrogen to soil, since the nutrient is contained in the plants' roots. You also can make a simple green manure by collecting green leaves and twigs from plants grown in wastelands, forests, and other areas, although growing green manure crops is more common in organic farming. Growing the cover crops yourself also ensures that you'll be getting organic material; it's hard to know whether wild plants in some areas have been affected by disease or even pesticide sprayings or applications. Typically, you till your green manure crop into the soil just before it flowers, which prevents the plants from going to seed and growing again after you dig them into the soil. Tilling before plants flower is critical; most of a plant's nitrogen is gone once it's reached the flowering stage. With some plants, you may want to let a few go to flower so that you can better attract beneficial pollinating insects. For larger plants, you may need to break them down first with hand tools or a weed whacker. 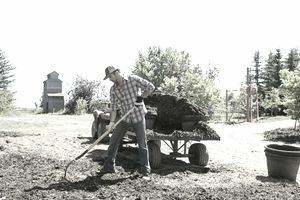 Allow two to three weeks after tilling so that the organic material can decompose, and then plant your desired crop. Some cover crops are easier to grow and till than others. If you don't have industrial farming equipment, most vetches, tares, and clovers are difficult to till. Be patient when figuring out what crops work best with your soil. Some crops do better in hard soil, others are more suited for light or dry soils, and your soil might even differ from place to place on your property. A few seasons may pass before you get just the right balance of cover crops, tilling, and replanting.